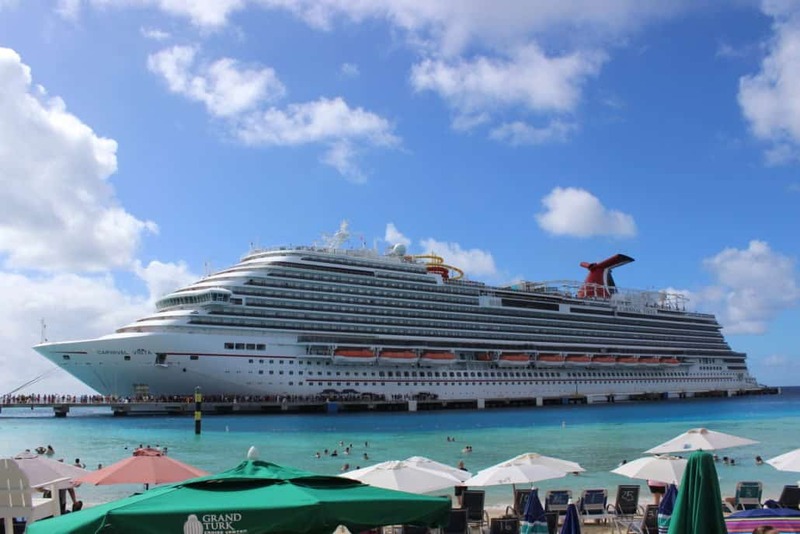 Located in the Turks and Caicos Islands is the Grand Turk Cruise Center, a cruise port that was built by Carnival Corporation in 2008. The port is designed to berth two cruise ships at a time and has one of the largest Margaritaville’s in the Caribbean inside the terminal gates. Guests usually flock to the giant pool with swim-up bar, or sit on the beach right in front of the cruise ship. For the guests that want to experience Grand Turk in a not-so Grand way (and free Wi-Fi), they can make their way down to Jack’s Shack. Jack comes from the northeast and was an engineer that was hired to develop the Grand Turk Cruise Center for Carnival Corporation. While he was down there, he was approached to help build a dive shop for one of his friends, and you could say the rest is history. When you disembark your cruise ship in Grand Turk, you will have to go through a gift shop before you can access the cruise terminal area. One you’re through the shop, turn left and walk down to the beach. When you’re on the beach and looking at your cruise ship, to your left will be the dock and to the right is miles of beach. You will to turn right and keep walking. You will eventually come to the end of the Carnival port area where you will notice there are no more beach chairs. If you look on the shore you’ll see pink houses, keep walking for a few more minutes and you’ll come up on (or smell the jerk chicken) from Jack’s Shack. Or you can look for Topher. Once you see him you know you’re close because he’s normally on the beach welcoming people. Topher (short for Christopher Columbus) is a Goldendoodle that came to Jack’s Shack several years ago as a little fluff ball. Now, he’s still full of energy and loves to entertain the cruise guests. There is nothing this dog won’t do. He goes paddle boarding, digs deep in the sand looking for crabs, swims, and patrols the beach to make sure no other dogs move in on his territory. As nice as he is, he’s really territorial. If stray dogs come on the deck at the shack, Topher gets aggressive with them and barks them off of it. If you want to grab a cocktail when you’re at Jack’s Shack, you can belly up to the tiki-style bar and get an island concoction or local Turk’s Head beer. If you want to go straight to the beach before other people do, get yourself a chair or ask one of the friendly workers there to help you get situated. The blue beach loungers are free but there is a $10 charge if you want to get an umbrella (and believe me, in the Caribbean sun you’ll need one.) The water is warm, blue, and clear, just as you’d expect at an idyllic Caribbean island. Grand Turk is a great port to forgo an excursion and just have a laid-back beach day, and Jack’s Shack is the perfect place to bury your toes in the sand. Jack’s Shack accepts cash, and credit cards with a $20 minimum. You can go to the Jack’s Shack website and sign up or print your voucher for a free rum shot while you’re visiting. It’s very simple and you can use it even if you don’t buy anything, just hand them the voucher and you’ll get a shot of rum, easy as that. I have been to Jack’s Shack a number of times over the last few years and always enjoy my beach day there. If you’re looking for a quieter, smaller alternative to Margaritaville, I highly recommend taking the walk down the beach to this fun spot. Is Jack’s Shack significantly cheaper than Margaritaville? Not really. But it does offer a break from the crowds and has locally sourced food that is cooked right in front of you. If you plan on using your credit you’ll want to ask them if the credit card machine is up. Hurricane Irma did a number to Grand Turk and the internet is still spotty. Once you go to Jack’s Shack once, you’ll return time and time again.